The Beatles' Apple Records: 40 Years Later Forty years ago Wednesday, The Beatles launched Apple Records. 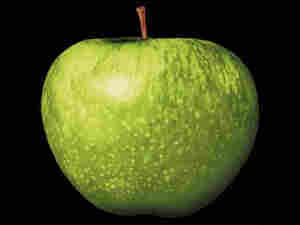 The label's trademark green Apple logo appeared on albums by The Beatles and other artists the band helped discover. It didn't take The Beatles long to show they were better at making music than running a business. 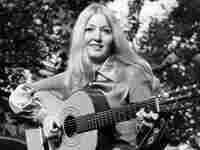 One of Apple Records' biggest hits was Mary Hopkin's "Those Were the Days," a song based on a Russian folk tune. "Tired of being shopkeepers," The Beatles' members give away thousands of pounds worth of Apple stock in Baker Street, London, on July 31, 1968. As part of NPR's occasional series, Echoes of 1968, we look back at that year's long-term impact. It was 40 years ago today that The Beatles launched Apple Records. The label's trademark green Apple logo appeared on albums by The Beatles and other artists the band helped discover. It didn't take the group long to show that it was better at making music than running a business, but Apple did hint at what was to come. The Beatles introduced Apple Records at a press conference in New York City on May 14, 1968. "It's a business concerning records, films and electronics," John Lennon said at the time. "We want to set up a system whereby people who just want to make a film about anything don't have to go on their knees in somebody's office. Probably yours." Lennon described Apple Records and its parent company, Apple Corps, as a place where anybody with a good idea could get funding. If that sounds like a questionable business plan, keep in mind that The Beatles were making a lot of money in 1968. "As far as I can tell, the idea behind Apple was a tax dodge," music journalist Douglas Wolk says. "The top tax rate in England at that time was enormous. And John Lennon said something to the effect of, 'We talked to our accountants. We realized we could either give the money to the government or we could put it into a business.'" The band's advisers reportedly recommended Beatles greeting cards or investing in real estate. The Beatles rejected those ideas. Just three months after it launched, Apple Records released its first single, "Hey Jude." From the beginning, The Beatles' members used Apple to put out records by other artists they liked, as Lennon and Paul McCartney explained in a 1968 television interview. "We hope to make a thing that's free, where people can come and do and record," Lennon said. "It'll be big, I think," McCartney added. "It's like a top. We're gonna set it going and hope for the best." 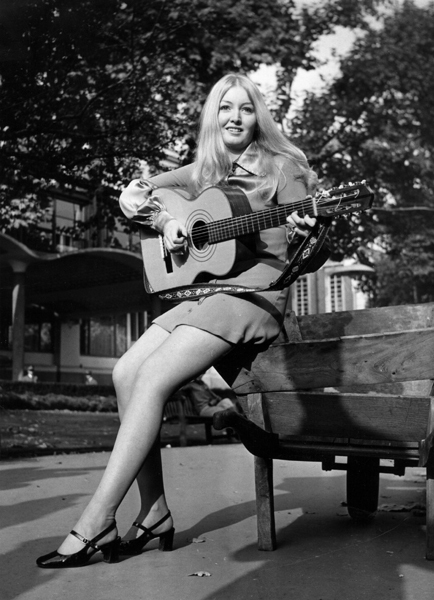 Apple put out three other singles on the same day it released "Hey Jude," including "Those Were the Days" by Welsh singer Mary Hopkin. That song also topped the charts. Apple Records wasn't the first label founded by musicians, but like most things The Beatles did, it attracted a lot of attention. 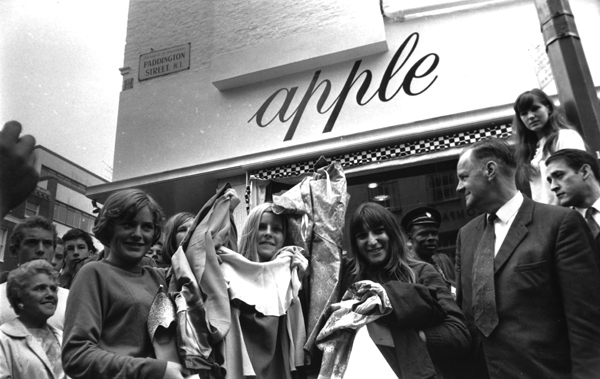 The Apple Corps offices in London's Saville Row became a magnet for assorted freaks. B.P. Fallon was 21 when The Beatles' publicist hired him to write biographical notes about Apple recording artists, including a then-unknown singer the label had signed named James Taylor. Fallon says that wasn't all he did. "One of my jobs at Apple was to make sure that Paul McCartney's grass was of sufficiently good quality," Fallon says. "Which meant that one had to dutifully test out the samples of all these eager-beaver hash dealers. He never once complained about my choice." Fallon insists that work did get done at Apple, but despite a string of initial hits, the company was a financial disaster. The film, electronics and clothing divisions didn't work out. And after The Beatles broke up, Apple seemed to exist mostly to sue people. It took its distributors, EMI and Capitol Records, to court over unpaid royalties. It sued Apple Computer over trademark violations. According to Bruce Spizer — the author of The Beatles on Apple Records — it's Apple Computer and its ubiquitous iPod that seem closer today to what The Beatles were trying to do back in 1968. "Everything that John had envisioned — this thing that was going to be records, films and electronics — and 40 years later, we've got music, videos and computer all tied together," Spizer says. "And one of the companies that's exploiting this is Apple. Although it's not The Beatles' Apple that's doing it now." Arguably, the real influence of Apple Records is symbolic. Before Apple, Wolk says, most artist-run labels were just vanity projects. "After Apple Records, there's this idea floating around that the musical genius' genius doesn't extend to their own work," Wolk says. "That they can spot genius in other people, that they can promote other people's work." It's an idea that gained currency in the 1980s and '90s, as musicians showed that they could successfully run record labels, too. Today, artists are taking on even more of the responsibilities that used to fall on the suits at record labels. In a story Thursday, we'll explore how.